We've now brought together two of our great services so you get an even better price. 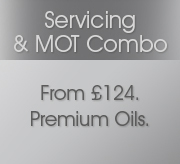 This Brilliant combo provides a Service, plus an MOT in one convenient package - and for only £99 including VAT, parts and labour. At Grays AutoCenters our highly skilled technicians use state-of-the-art equipment to get the job done fast. After the test we explain in simple English if we've spotted anything that we think needs attention. You choose when and where to get any repairs done. Regular servicing saves money on fuel costs and prolongs the life of your engine. Enjoy complete peace of mind knowing that our technicians will get the job done fast and efficiently using the latest technology. While we service and test your car, why not relax on a sofa in our comfortable lounge - browse this month's glossy magazines or surf the web with our free Wi-fi access while sipping a complimentary frothy coffee.